How the hell do you write a #1 song? Don’t we all wish we knew the “secret” to that! Well, maybe there is a way to unravel some of the answer. Songwriting is an art. Songwriting is a craft. But is songwriting a science? Can we test it scientifically and come to certain conclusions about what works and what doesn’t and then reduce “success” to mathematical formulae? We thought it would be interesting to subject songs to F-K analysis and see how they scored. The results will probably surprise you. We also think they provide a powerful road map to what you should be doing in your own writing if you aspire to write #1 pop hits. So that you have some frame of reference with which to understand our results, in a book entitled “Fiction Writer’s Brainstormer” by James V. Smith, Jr., Mr. Smith tested ten bestselling novels# with F-K. On the F-K Grade Level scale or score, the books tested in a range of 2.68 to 6.3. The average grade level was 4.4! Here are some other points of reference. Figure 1 that follows presents a scattergram of the seventeen #1 songs. The number on the vertical axis represents the grade level a reader would need to attain to understand the song. 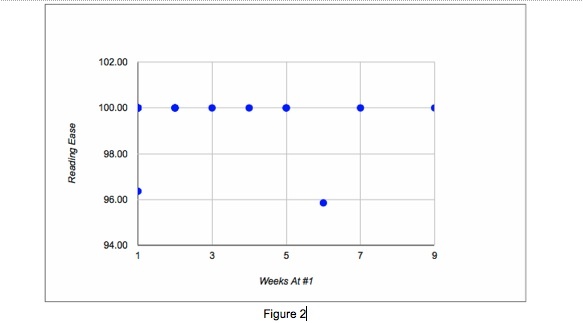 The numbers on the horizontal axis represent the number of weeks each song was at #1. 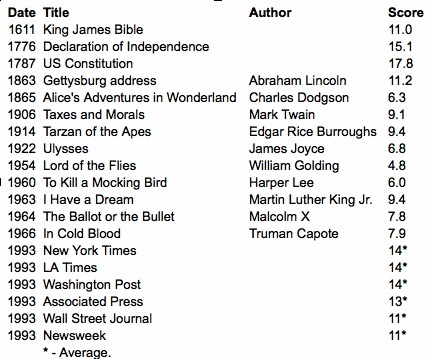 The average number of words in sentences. The average number of syllables in words. But, there are other factors at play in measuring the complexity or simplicity of writing. 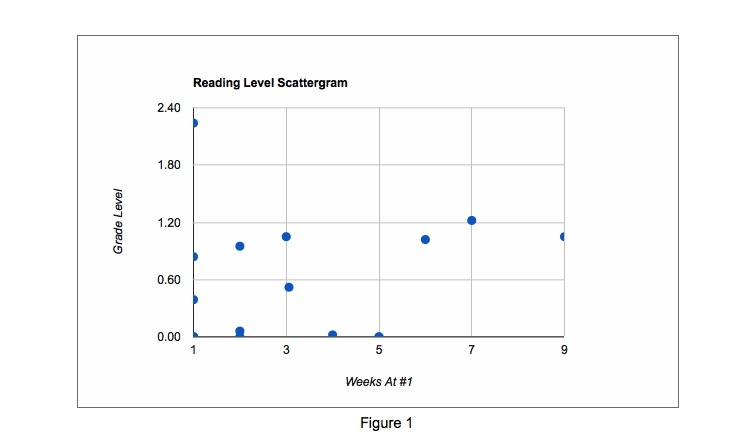 Accordingly, Messrs. Flesch and Kincaid came up with a more complete analysis, the result of which they call the “Flesch-Kincaid Reading Ease” score. Let’s look at the same songs rated by this formula. Average number of words in sentences. Average number of syllables in words. 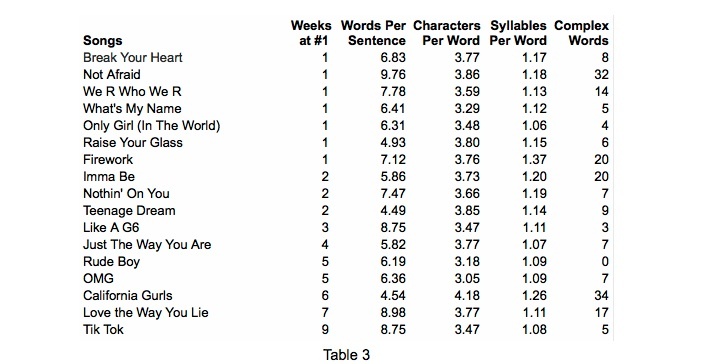 Word length as measured by letters. The number of “complex” words (words of greater than 2 syllables). Another way to look at this is to aggregate all of these #1 hit songs as in Table 2 that follows: What these values represent are (1) the average for each column heading, (2) the maximum value for all of the seventeen #1 songs and (3) the minimum value for the same group. Before we comment on Table 2, let’s look at all of the songs and their values. What should be clear to any reader at this point is that if you want to write hit pop songs, you need to be an economical wordsmith. Your sentences need to be short—shoot for around seven words or at least generally, between 4 and 10 words. Your words need to be short—shoot for three to four characters per word. And finally, stay away from complex (more than two syllable) words unless you are as gifted a writer as Eminem (Not Afraid” and “Love the Way You Lie”) or your hook is the more-than-three-syllable word and you repeat it so much nobody could possibly misunderstand what it is (Katy Perry’s “California Gurls”). Even in the cases in Table 3 that have a lot of complex words like “Firework” and “Imma Be,” those songs have so many repeating short words that the average number of characters per word in both songs is below 4—those are very short words indeed. The lesson in that is that if you are using a lot of complex words, you will have to offset that complexity with short words to keep your averages low. At this point, no doubt some of you are sticking your fingers down your throats and hurling and saying “if I have to write kindergartner songs, fuggedaboutit.” But, is that really what these songwriters are doing? We think not. A song is not a book or an insurance contract. You don’t generally read it. You listen to it. Moreover, when you listen to it, it is zipping by at a set pace. You can’t slow it down. You can’t pause it (at least not if it’s coming out of your radio). Moreover, whether you are in your car, surfing the net, or at home washing dishes or cleaning or whatever, your attention is more times than not diverted by other activities. The F-K models were designed for the written word, not songs. They are measuring something meant to be focused on exclusively and something that can be lingered over and read at one’s own pace. It’s pretty hard to read and “multi-task” at the same time and actually comprehend what you are reading. If one were to build versions of the F-K models for analysing songs, the “distraction factor” would no doubt be taken into consideration and the results would be different. In short, we believe “K through 1” for songs translates to several grade levels above that in the prose world—perhaps more in the neighborhood of the 4.4 range of the average hit novel referred to earlier. Moreover, hit novelists like John Grisham or Elmore Leonard recognize that their readers read their books, not to uncover the secrets of life, but for entertainment. Typically, these books are read fast by the reader and need to “read easy” to draw the reader in. Who wants to relax with a novel written like it’s a stock prospectus or a peer-reviewed technical article? If 4.4 is good enough for John Grisham, Stephen King, and Elmore Leonard, it’s good enough for us and we hope for you! Put another way, the genius of all of these writers; novelists as well as songwriters is that they are smart enough to write to the level of their audience taking into consideration the special conditions of their medium. In doing so, whether they arrive at it through years of hard work or simply brilliant intuition, they communicate effectively to millions of people. One final thought on this “simplicity” angle. You read a book, laugh with it, cry with it or whatever. Then you put it down and walk away from it. You don’t hum it. You don’t roll the words over in your mind. It’s read, it’s done. Is that the case with songs? No, a song is a different animal. It is consciously constructed in a way to enhance memorization. It has a hook, the music is typically “hooky” or hypnotic or draws you in in some way. Why else rhyme in a song but as an aid to memorization? Isn’t it a fact that it’s easier to memorize short sentences made up of short words than the opposite? And what is a songwriter’s job? What’s his or her raison d’être? Is it to make you think they are smart? (We’ll just say it—hell no.) World peace? Save the whales, split the atom or some other heady noble cause? Well maybe and certainly songs have been vehicles for wonderful messages and can and have been agents of change. But, above all, the songwriter’s job is to make you love the song and hence, the artist! His or her job (the songwriter) is to hook you! If after hearing their song for the first time you are humming it and maybe singing along with the choruses and within a few hearings, you know the whole damn thing and love it, the songwriter has succeeded. Accordingly, great songwriters have figured out that the key is simplicity. Sometimes, like Bob Marley or John Lennon or Eminem they use that simplicity to say something very deep and important, sometimes they merely sing the praises of California Girls. To “add a little meat” to this point, Eminem had two #1 pop songs in 2010. “Not Afraid” is a no-holds barred, bare-your-soul acknowledgement of the artist’s battles with addiction. His “Love The Way You Lie” duet with Rihanna is an equally raw exposé of men beating on women. 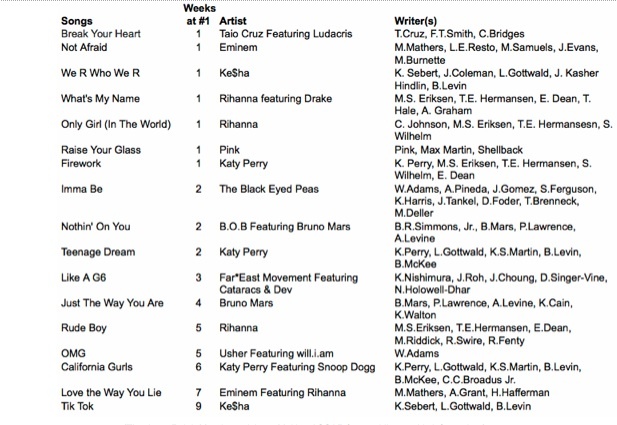 Moreover, “Love The Way You Lie” was the 2nd longest running pop #1 of 2010 at seven weeks. Is that all there is to it: short sentences and short words? Well, no. Not exactly. To prove that point, we ran a couple of outlandish tests. We used an online random word scrambler on Ke$ha’s 9-week #1, “Tik Tok.” The word scrambler kept the line length intact and used all of the words in “Tik Tok,” but scrambled them into incomprehensible gibberish. The F-K scores were pretty much the same on this scrambled text as on the real lyric. We then translated the song into French and ran it through the F-K models. Again, virtually identical results. The point is that short sentences and words can help make a song more comprehensible, but if you write crap, short crap is still crap! We believe the writers of these #1 pop songs know the wall they are up against. If you want a vehicle to communicate, whether its pop silliness or primal scream, you first have to make your music accessible. We believe the key to that in today’s music is short sentences and short words—it’s that simple. We hasten to add though that there are many other variables to success—the music, the arrangement, the artist, not to speak of promotion. But, if you don’t get the words right, forget the rest. So, to answer our own question at the outset of this article, yes, the scientific method can measure what we all do when we write songs and can provide insight into our craft. ——————- Credits: The author is songwriter Bud Tower. Bud’s latest cuts are the title track of Lynyrd Skynyrd’s 2009 album God & Guns and the Hank Williams Jr. radio single, “Red, White & Pink-Slip Blues.” Bud is also creator of what many consider to to be the finest rhyming resource in existence online or off, www.WikiRhymer.com. Bud was assisted in the preparation of data for this article by Nashville-based Belmont University student and songwriter, CJ Solar.